The largest asset management firm in the world with approximately $6.4 trillion USD in assets, confirmed that they will not launchi an exchange traded fund for cryptocurrency until the industry grows up a bit. 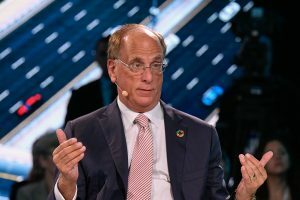 Even though the CEO Lary Fink, is pretty bullish on the blockchain technology, he is still not so convinced by but the cryptocurrency itself. In his CNBC interview he confirmed that it is important to notice that the company is not shutting its doors to crypto investments and related products. They simply still don’t believe that they were ready to do it at this time. Why? Because it was not “legitimate”. When we mention legitimacy, it’s important to say that the Securities and Exchange Comission (SEC) has also shared its own doubts about a bitcoin ETF, and still needs to approve any of the multiple applications. The SEC has often postponed the decision to release the companies to launch the ETF, so everybody in the crypto market is eagerly awaiting the for ETF and the expected bull market. If Bitcoin is further regulated, there is a higher chance that ETFs will be approved and that investors will have enough confidence to put their money on an ETF. Fink said that he believes having some backing from the government is very important for the asset to get the legitimacy that it needs to grow. The main problem, he said, is that governments will only allow it when they see that it will not be used mainly for tax evasion. Even though we are all waiting the “legitimate moment”, this seems to be pretty big step for Fink who was known to be more than just “bearish” about the cryptocurrencies. In July he was asked in an interview on Bloomberg TV if it the reports about his firm working on some kind of crypto-based were true. Although Fink seems against crypto-backed investment vehicles, SEC has recently revealed that a paramount closed-door meeting occurred regarding the future of Bitcoin ETFs. Earlier this year in June 2018, derivates marketplace Chicago Board Options Exchange (CBOE) filed for Bitcoin-based exchange-traded-fund (ETF) with the U.S Securities and Exchange Commission (SEC). The Bitcoin ETF shares are backed by VanEck Solidx Bitcoin Trust and will trade on regulated U.S. Exchange ‘CBOE BZX’, upon listing. According to a memorandum of the event, which occurred on October 9th, Commissioner Roisman, who has been classified as “pro-crypto” by some, four legal counsels, and five representatives from VanEck, CBOE, and SolidX Partners were all in attendance. More specifically, in a slide titled “VanEck SolidX Bitcoin Trust Should Be Approved,” ETF advocates noted that monumental progress has been made. VanEck claimed that there now “exists a significant regulated derivatives market for Bitcoin,” adding that CBOE’s rules dictate that market surveillance will be a priority in the proposed fund.